Are you ready for a challenge? We invite you to take the 30 Day Challenge to Unleashing The Power Of Positive Confession. It promises to be intriguing, challenging and life changing. We will be using our words to create a new healthy lifestyle, total outlook and mindset. You too can be a part of it, no matter where you are. Best of all, it’s FREE to join. I'm a believer! It works! I participated in the 30 Day Challenge, before the end of the 30 Days , my appetite for food completely changed. I eat salads as a side dish but they wouldn't be my option for lunch. Now I'm craving salads and healthier foods. Thanks to the Body Declaration I used daily during the challenge. 1. You will receive an email with a link to the “Body Declarations”. The “Body Declarations” are powerful confessions I wrote as inspired by the Holy Spirit that has the power to transform your spirit, soul and body. 2. During the 30 Day Challenge, you will begin to speak out the “Body Declarations” aloud to yourself, with power, purpose, attention, strong desire, faith and persistence. Listen to the powerful and enlightening teaching by Ade, our anointed fitness instructor, on Power of Positive Confessions below. As you start the 30 Day Challenge, you will speak out the “Body Declarations” aloud to yourself, with power, attention, strong desire, faith and persistence. Use the calendar to monitor your progress. Words have power, presence, and prophetic implication, with no geographical limitation - Dr. Cindy Trimm. The words you release out of your mouth can either create a good thing or a bad thing. We encourage you to get a journal and write down the change you observe as they happen and do the declaration at least once a day, you can do it as many times you want in a single day. The more you hear it the quicker it would transform your thinking. Research has shown that you believe what you hear yourself say more than what you hear other people say and for every negative word that you have said, you have replace it with positive affirmations at least 13 times before it begins to resonate with you. 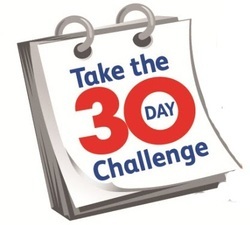 We are so excited about this challenge and we are looking forward to hearing how participating in this 30 Day Challenge is impacting your life. You can fill the form below. Use the subject line “30 Day Challenge Testimonial”. God Bless You! Interested in signing up or want to share your experience during the 30 Day Challenge? Use the subject line "Joining the 30 Day Challenge" or “30 Day Challenge Testimonial”.